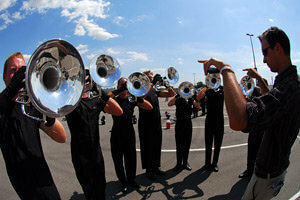 Participation in a drum corps is a dramatic positive experience for most young people. 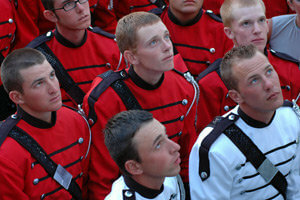 Each corps offers a unique combination of education, life experience and tradition. Because of this, matching student and family expectations to the right corps is important. At the heart of the drum corps experience is a set of values – dedication, discipline, commitment and achievement through teamwork – that enhances the student's life. Young people soon discover that dedication and hard work enable them to achieve tremendous success. Success, in turn, promotes confidence in their abilities. Students learn and improve valuable personal skills like teamwork, time management and problem solving. Members of all DCI-affiliated corps are challenged to personally accept a new sense of discipline and responsibility. Above all, one of the key things drum corps participants learn is simply stated, but complex to convey – how to get things done. While a substantial number of Drum Corps International alums are music and performing arts educators and professional performers, some are doctors, lawyers, business professionals, entrepreneurs and leaders in their chosen fields and in their communities. Regardless of the life path your son or daughter expects to follow, the Drum Corps International experience enhances the likelihood of success. The drum corps experience itself provides a multifaceted education. First, there is the music and performance education provided by the corps' staff. Second, there is the life and values education that is attained by participation in an intense, focused effort to achieve excellence. Aside from the music, performance and life education that comes directly from participating, many studies indicate that performing arts students show higher levels of academic achievement in all disciplines than students who do not participate in performing arts. Nearly 80 percent of the World Class corps students who participated in DCI's most recent Project Persona research study, reported a grade point average above a 3.1 at either the high school or university level. The degree of performance/music education students receive depends upon the corps. A solid rudimentary education is likely to be available with some groups while others are likely to deliver an educational experience on par with a university-level performing arts curriculum. Regardless, the life education and experience gained from being part of any DCI group is likely to have a positive effect on your son or daughter. >> NEXT SECTION: What's the Cost?